WPEngine is an innovation-driven managed WordPress hosting provider. It provides a best-in-class and highly redundant architecture which keeps WordPress fast, scalable and secure. One can create a local backup of the website and also staging site instantly for testing. WPEngine was founded in 2010 and headquartered in Austin, Texas. Here is the WPEngine promo code for you today. Get 2 months of free hosting with WPEngine on any shared annual plan and utilize the enterprise class technology and top-notch customer service that comes stock with every plan. 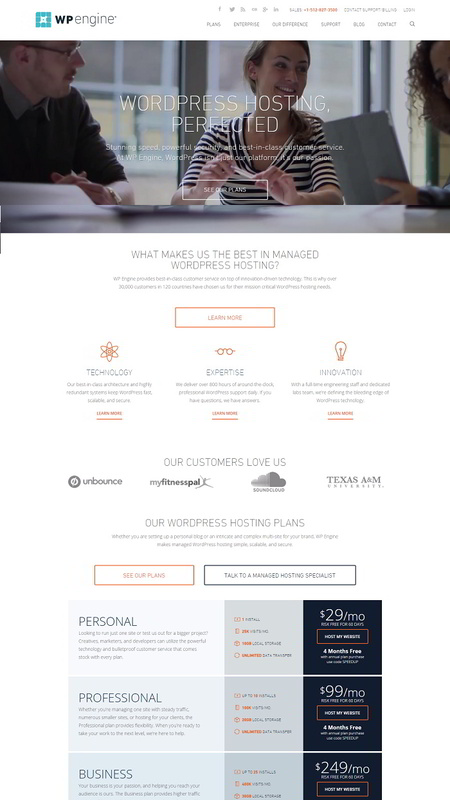 WPEngine offers wide range of shared managed WordPress hosting plans. Price starts from $29/mo for 1 install and unlimited bandwidth on all plans. Please note that this is a limited time offer from WPEngine and applies to first time user. The renewal will be at regular price. WPEngine is’t just a hosting provider with stunning speed, top security, and best-in-class customer service, your website would get a good long term home.